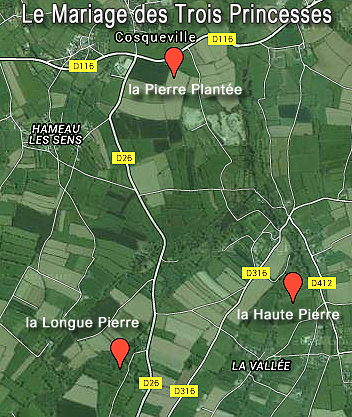 In Lower Normandy at the hamlet of Hacouville, and an easy walk from the little Chapelle Notre Dame stands the menhir "La Haute Pierre". 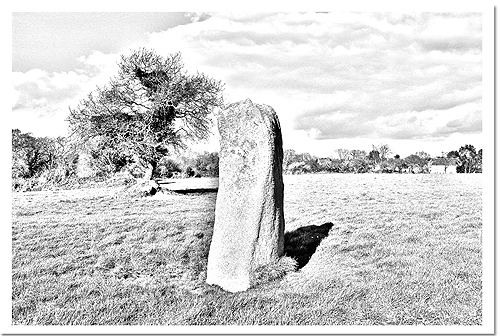 A standing stone measuring a height of 2.80 meters with 1.80 meters of it pressed into the ground. It is of Neolithic origin 2 - 3000BC. that consists of the local granite found on the nearby coast. 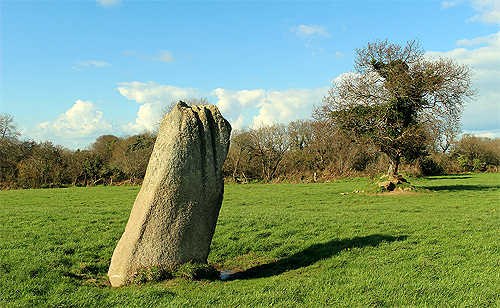 The Stone also known as the High Man (or stone) is in good condition in the centre of a large field. 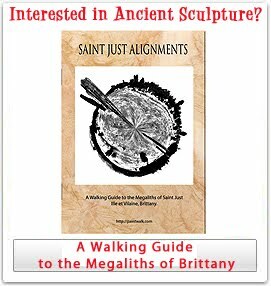 The menhir has at its top and on two of its sides, two vertical parallel grooves, approximately a metre long. These grooves pass through the top of the stone and go down to the opposite side. They were probably carved by Neolithic human hands. Nearby the stone is a tree growing out of a lump of what looks like a round barrow, but this could be the remains of the local bocage. Either way it certainly adds an expression of the ancient feel to the area. "La Haute Pierre" showing marked grooves. It forms part of "Le mariage des trois princesses " the Marriage of Three Princesses" A folklore tale which designated three fairies who were turned to stone. 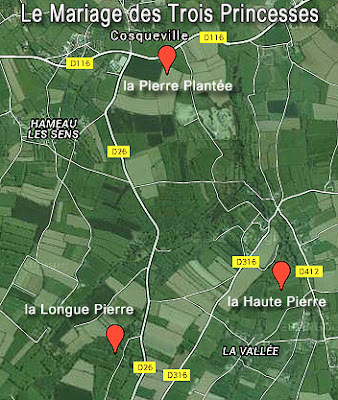 The fairies are marked by the three menhirs la Haute Pierre, la Longue Pierre and la Pierre Plantée, all detailed on this blog. An endowment of the fairies, claims the legend, is buried in the centre of the emblematic triangle formed by these three stones. The location of the endowment is marked by a lake which is now called "Lake Pelot". The legend concludes that the lake was caused by generations of people searching for the lost endowment, which over time gradually filled up with water until the treasure was lost forever. 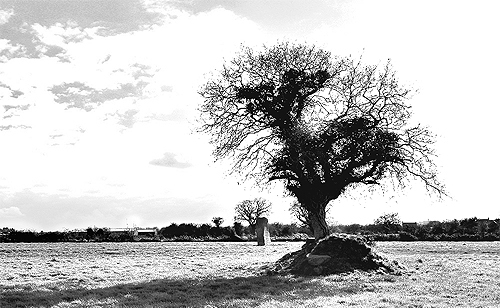 It is possible to see the menhirs across a couple of fields from a parking place near to the little Chapelle Notre Dame at Hacouville, where there is a little notice board. Move down the road opposite the church and a dirt track to the right takes you into the field. 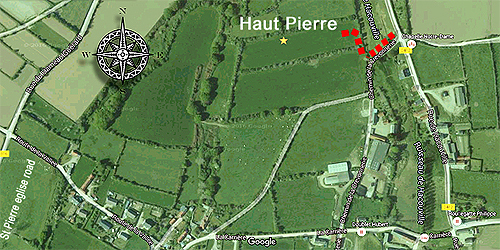 Walking map to "La Haute Pierre"
A Walking route is not currently available for the google virtual tour but the stone can be seen easily from the tiny Chapelle Notre Dame at Hacouville where there is space for a car. It’s a short walk from the chapel and the stone can be seen from it. Walk down the road opposite the chapel and take the first right into the field. It can be be muddy after rain, but from spring onwards you should be able to get to it easily.